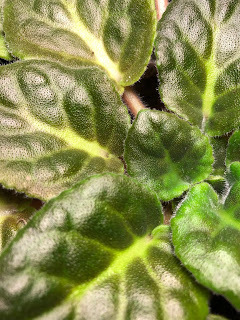 I mentioned the other day that I have been given the Great Responsibility to care for a friend's African violet (Saintpaulia sp.) that was once his mother's and before that it was his grandfather's. I am taking my Great Responsibility seriously. For starters, I read up on the care of African violets, even though I know how to care for African violets. I wanted to be sure I didn't have any gaps of knowledge and understanding of African violets brought on not by my advanced years but by simply not having had any African violets around here in quite some time. My friend told me how he has rooted leaf cuttings from this African Violet and given them to others, and how one friend sent him a picture of the one he gave her when it was in bloom. He laughed as he told me that it was a completely different color and not at all the plant he had given her. He figured the African violet he gave her died and instead of admitting that, she bought another one and claimed it was the one he gave her. Well, I won't be doing that because for starters, this African violet is going to live under my care. It's going to thrive. It's going to bloom. Plus, it is not currently blooming so I have no idea what color the flowers will be. Not to mention it is an old variety, or I presume it is old because his grandfather, its first caretaker, died decades ago. Who knows if I could even find one exactly like this one, even if I tried? I have placed the Great Responsiblity, as I have taken to calling this African violet, under a small table-top grow light right beside my bathroom sink, where I can see it every single day, multiple times a day. My friend was keeping it in a south facing window, but if I did the same, it would be in my den, a room I don't spend much time in except when I am paying bills or filling out my tax returns. Shudder. That room is no place for an heirloom African violet that I am watching so carefully. If I run into any troubles with this dear plant, I'm heading straight to my personal library, not the Internet, to find answers, cures even, if that's what's needed. For starters, I own a copy of 1,001 African Violet Questions Answered by Twelve Experts, Helen Van Pelt Wilson, Editor (1958). One of the contributors, Betty Stoehr, was from my hometown. I remember when we would drive out into the country on a Sunday afternoon, perhaps to go fishing at a local farm pond, we would pass by a house that had a sign out front advertising African violets for sale. I wonder if that was her house? If so, she actually lived in the countryside outside my hometown. Anyway, I can't imagine I would have a question about African violets that isn't answered in that book. If I do, surely the answer is in All About African Violets by Montague Free, originally published in 1949, but I have the 1979 edition. My "mid-century modern" collection of gardening books also includes some general indoor gardening books. But with two books on African violets specifically, I doubt I'll need to refer to Making Things Grow: A Practical Guide for the Indoor Gardener by Thalassa Cruso (1969) or How to Grow Rare Greenhouse Plants by Ernest Chabot (1952). But I can take comfort knowing I have them just in case I need them. Anyway, the Great Responsibility finally has a flower bud on it so I'll soon know what color it is! Brave, brave soul. It is quite a responsibility, but you are up to it! I know it will thrive in your care. You are brave. I don't think I'd ever babysit someone else's plant. have a friend that watches over a third friend's bonsai tree whenever they go on vacation. Too much pressure! Good luck. I kill African violets. Always have. I don't bother anymore. I'm sure you'll do fine! Since your books for care are the same vintage as the A.violet it should fare well for you. Have fun don't stress over this. Enjoy the new blooms. I have all but given up asking friends to care for plants. I know it stresses them out and stresses me out too. I hope all goes well. Maybe it will bloom in time for a Wednesday Bloom post!